When the World Heritage Commission met in 1996 to accord World Heritage Site status to the ruins of Czech architect Jan Letzel’s renamed building – the Atomic Bomb Dome in Hiroshima – America objected, concerned at the nomination’s ‘lack of historical perspective’. Extraordinarily still standing, despite being just 150 metres from the epicentre of the bomb that ended World War II on 6 August 1945, and since a cornerstone of the Hiroshima Peace Memorial Park, the former Prefectural Industrial Promotion Hall is also the indomitable focal point of Jean-Gabriel Périot’s remarkable Nijuman No Borei (200,000 Phantoms). 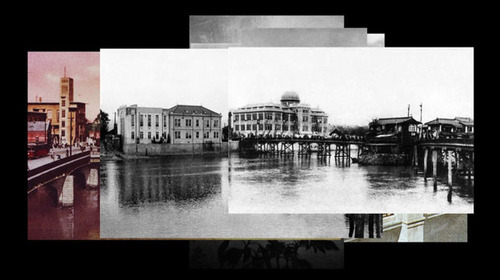 The film layers archival photographs of the building from 1914 to the present day, chronologically superimposed on top of each other, pivoting around and anchored by multiple views of the preserved ruin as Current 93’s soundtrack teeters on the brink of a potentially didactic bathos. What pulls this work back from a pacifying nostalgia so convincingly is something that is key to Périot’s work as a whole, an indicator of his common themes and the counterpoint to an uncompromisingly expressed emotional sensibility: that the accumulation of images is a history in which we are complicit; that to accumulate images is profoundly to reconsider history not as a stable, received narrative but precisely to expose it as a collection of myriad perspectives. This is at the core of 200,000 Phantoms’ beguiling simplicity: as images move from black and white into colour, the building’s skeleton becomes the locus of memorialisation as well as a memorial itself – in actuality and here in its sequential, two-dimensional imprint. It remains, amidst the optimism of modern architecture, the subject of repeated preservation attempts and, significantly, as an image repeated to the extent that it becomes simultaneously, defiantly incontrovertible and, along with time and space, radically almost tangible – in fact, the very materialisation of historical perspective. Nowhere in Périot’s films is such tangibility better exploited than as in Undo (2005), where footage of contemporary disaster, suppressed protests, violence inflicted, human against human, is simply reversed. The naïve optimism of the film’s formal strategy is caustically undercut by the reality of its documentary material – these things actually happened, these people actually died – such that the work’s willful turning back of time becomes pointedly imaginary and poignantly hopeless. Périot’s work extends from a politics of the self in his early videos that are ironic exegeses of sexuality. It is deeply affecting not just because of the harrowing and explicit images that it sometimes deploys but also because its absolute indictment of all violence, prejudice and destruction appeals to this imaginary while confronting us with the damning recording of events in our time. 21.04.02 (2002) is a torrid taxonomy of images, an immediate present and a direct response to the election success of the right-wing Jean-Marie Le Pen on that day. In Even if she had been a criminal (2006), archival footage of World War II rushes past our eyes until we are confronted with deeply disturbing images, not of Nazi atrocities, but of the French cutting off the hair of every woman suspected of collaborating with the German occupiers. Again, ‘we’ are complicit. If this work is didactic then it is also unashamed, arguing for the necessity of didacticism: an emotional politics that ultimately disorientates and strangely transcends the subjectivity of which it is defiantly constituted. Ian White is Adjunct Film Curator at Whitechapel, London and an independent curator, writer and artist.